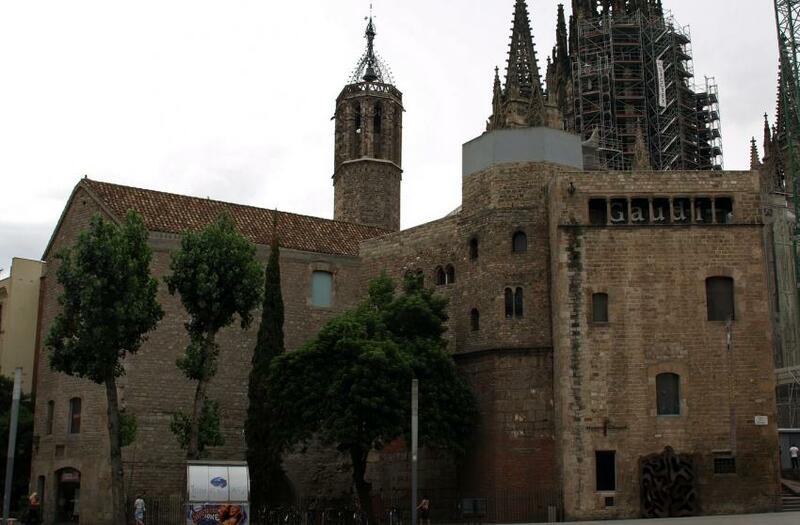 Art garnered from the diocese of Barcelona has been pensioned off to the left of the cathedral in the Pia Almoina, the headquarters of one of Europe’s oldest charitable foundations, founded in 1009. The current building, incorporating part of a Roman tower and its prophylactic head of Medusa, dates from 1423, and has been restored to house this excellent but often overlooked museum. Among the treasures are the striking Sienese-inspired Taula de Sant Jaume, by Arnau and Ferrer Bassa; a beautiful letter from the 'royal bureaucrat' Philip II, in Latin; a reliquary of Sant Cugat (1312); a tormented Crucifixion from the 13th century; and Romanesque frescoes of the Apocalypse from the apse of Sant Salvador de Polinyà (1122), a harrowing precursor of Picasso’s Guernica and a preview of the treasures in the Palau Nacional. The Custodia de Santa Maria del Pi (1587) by Llàtzer de la Castanya is a masterpiece of the goldsmith’s art, and there are retables by Bernat Martorell and the Portuguese Pere Nunyes. A startling 15th-century anonymous retable of Sant Bartolomeo is a candidate for the goriest in Barcelona (although it has plenty of competition); here the saint, peeled of his skin, goes right on talking until his indignant persecutors lop off his head. A new exhibition put on by Gaudí BCN Projects, 'Walking with Gaudí' includes documents and objects relating to the architect, along with augmented reality displays, video, multimedia displays and holograms and all the latest research into the man, his inspiration and his revolutionary methods.